Romanian fascist Corneliu Zelea Codreanu denied facts and evidence. How Romania’s fascist leader masterfully obscured the truth to justify anti-Semitic attacks and undermine democracy. 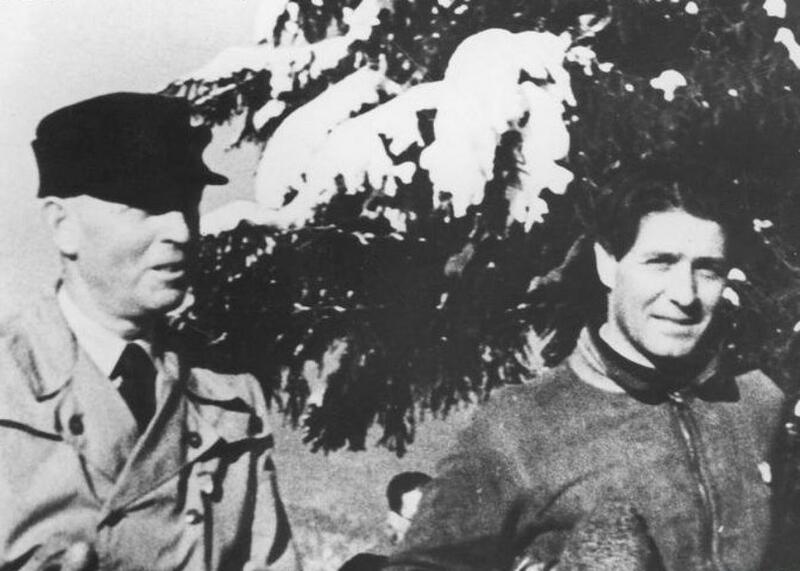 Portrait of Romanian officer and future military dictator Ion Antonescu (left) and fascist leader Corneliu Zelea Codreanu in 1935. This article supplements Fascism, a Slate Academy. To learn more and to enroll, visit Slate.com/Fascism. Excerpted from An Infamous Past: E.M. Cioran and the Rise of Fascism in Romania by Marta Petreu. Published by Lyons Press. With the formation of the Legion of the Archangel Michael in 1927, the Legionary movement in Romania began to take shape around the personality of its leader Corneliu Zelea Codreanu (1899–1938). On Sept. 4–6, 1920, in the city of Cluj during the first Students’ Congress following the Union of 1918, Codreanu and other Jassy students successfully introduced a motion banning all Jews from student associations. Later, during the 1920–1921 academic year, as chairman of the Jassy Law Students Association, he initiated a series of pro-Christian, anti-Communist, and anti-Semitic activities. Codreanu developed a clear action plan: Unite the students into a single organization, a “national movement of the Romanians, because, on the one hand, the Jewish problem is not of the University alone, but of the entire Romanian nation and, on the other, the University alone cannot solve it.” His proposed student organization would fight “for a government exercised by the national movement,” a government that would solve all problems, the Jewish one included. By rejecting the particular claims of the students and their desire for immediate solutions, and by cunningly replacing them with an ideological motivation—supposedly the students were purely altruistic, willing to disregard their personal needs and, like true national martyrs, trouble themselves only with the needs and the aspirations of their nation—Codreanu deliberately turned a concrete local problem into an ambiguously defined national issue that the Romanian government could no longer solve. Codreanu attempted to radicalize student demands, take them beyond the confines of the university, and create around them a “national Romanian movement” designed eventually to seize power. The result of Codreanu’s initiative was the creation in Jassy, on March 4, 1923, of the National Christian Defense League (NCDL), and in the spring of 1923, once Romania’s new constitution had guaranteed Jewish civil and political rights, Codreanu organized a protest rally in Jassy that ended with the devastation of a Jewish neighborhood. He was imprisoned for a week. Then, on Oct. 25, 1924, after repeated clashes between his men and the Jassy police and at the conclusion of a trial in the Jassy courthouse, Codreanu shot police prefect Constantin Manciu and two other police officers. During his trial (held in Turnu-Severin between May 20 and 26, 1925), Codreanu declared that “it was my faith and my love of this country that guided me in my struggle, in everything I did. We pledge to fight until the end”—that is, to carry on with assassinations of “vile Romanians” “traitors” and Jews. Codreanu was acquitted, to the enthusiasm of the crowd. During the trial, the defense argued that “We do not wish to make Codreanu a hero for having killed Manciu, but rather because he was the leader of a movement seeking our national awakening.”1 Codreanu’s explanation for the outpouring of popular enthusiasm triggered by his acquittal had to do with the mechanisms of a “national mystique”: His action had awakened the “soul of the nation,” he said, so he was seen as a redeemer, a leader of the national cause. At the time, this ethnic structure of the Romanian population was hardly unusual for a Central or East European country. As pointed out by Iuliu Maniu in “The Issue of Minorities,”3 in Czechoslovakia they amounted to 34.5 percent of the population, in Poland 34 percent, and in Yugoslavia 20 percent. But the extent of the minorities was new to Romania. Hungarians, Germans, and Jews were actually better off economically than the Romanian majority, and they largely belonged to other cultures (Hungarian and German) that were more advanced than Romania’s. The Jews presented the thorniest problem: With 722,120 people, they amounted to 4 percent of Romania’s population. Later, in 1939, Alexandru Safran (who became Romania’s chief rabbi in 1940) calculated a Romanian Jewish community of about 800,000, “fourth in the world in terms of its numbers.”4 According to the census of Dec. 29, 1930, the Jews were the most urbanized population of Romania: 68.2 percent of them lived in cities and only 31.8 percent in rural areas. As one might expect from their predominantly urban distribution—Jews formed 13.6 percent of Romania’s urban population—they belonged to more elevated and highly cultured socioprofessional groups. In short, the minorities that were now part of Greater Romania—economically better off, culturally and religiously “different,” and amounting to a sizable fraction of the population—became an object of envy, fear, and hostility for the Romanian majority. Skillfully manipulated and exploited by nationalist extremists at a time when intolerant nationalism was emerging throughout interwar Europe, such feelings provided an endless supply of political capital. Codreanu’s xenophobia and anti-Semitism were grounded in his understanding of such concepts as “people” and “nation.” Codreanu’s definition of the nation is quite vague: “a century-old historical entity whose roots go back into the mists of time and whose future is infinite.” On the one hand, the nation included “All Romanians [Codreanu capitalized the word “Romanian,” which is not ordinarily done in the Romanian language; but he used lowercase for the names of all other nationalities] inhabiting the same territory, having the same past and the same future, the same garb, the same language, the same current interests,” as well as “1. All living Romanians. 2. The souls of all the dead and the tombs of our ancestors. 3. All those who will be born Romanian.” Thus the people—defined by ethnicity and including the living, the dead, and those yet unborn—and the nation became one and the same. The idea of a people-nation was also related to that of the state and democracy. Legionary doctrine was manifestly anti-democratic. The democratic state—led either by the Liberal party or by Iuliu Maniu’s National Peasants party, it did not matter—was seen by Codreanu as an institution directed against the people; significantly, an entire section of his book For the Legionnaires was entitled “Democracy Against the People.” For Codreanu, democracy was irremediably flawed. Its primary flaw was that it relied “on the elective principle”—Codreanu firmly opposed “universal suffrage” and the 1923 constitution that guaranteed it. Although he never expressed his argument against it in coherent form, Codreanu’s reasons were twofold. First and foremost, he thought that universal suffrage “turns millions of Jews into Romanian citizens. It makes them equal to the Romanians. It gives them equal rights in the country. … On what grounds can the Jews claim equal treatment, equal political rights with the Romanians?” Second, while democracy claimed to establish the “truth” on the basis of majority numbers, “Truth is not the province of a majority, or of a minority.” The whole masquerade of the ballot box made it so that “the real elite of a nation is defeated, cast out,” because the “mob” was fickle and unreliable. These continuing attacks against the universal suffrage introduced and guaranteed by the 1923 constitution, usually made from the vantage point of extreme nationalism and xenophobia, utterly disregarded the fact that the universal ballot of 1923 had been the only system of voting likely to guarantee the principle of national sovereignty. In other words, without the 1923 reform effected by the new constitution—a reform that occurred after the Great Union of 1918 and the diversification of Romania’s ethnic structure—a right to vote given on the basis of criteria such as wealth, education, family, or urban/rural environment would never have been able to ensure the national character of the Romanian parliament. In turn, the Legionnaires and all those who attacked the Romanian electoral system were in fact challenging the national foundations of the Romanian state. Democracy favored the politicians, thereby “shattering the unity of the Romanian nation”; split into opposing parties, the nation was no longer able to face “the united bloc of Jewish power.” Much of the criticism of Romanian democracy between the wars was well founded. Corruption was indeed rife in public life, and so was the dominance of the politicians. But the Legionnaires never sought to remedy the flaws of Romanian democracy, only to eliminate democracy as a form of government. Excerpted from An Infamous Past: E.M. Cioran and the Rise of Fascism in Romania by Marta Petreu. Courtesy of Lyons Press. 1. See “Apararea,” Adevarul literar si artistic: 9. 2. Sabin Manuila and Mitu Georgescu, “Populatia României,” in Enciclopedia României, 1 [Bucharest: Imprimeria Nationala, 1938]. The data are based upon the 1930 census. 3. Iuliu Maniu,“Problema minoritatilor,”conferencepaper(11May1924),inDreptulla memorie în lectura lui Iordan Chimet, 2 (Cluj: Dacia, 1992), 321. 4. Alexandru Safran, Un ta ciune smuls flacarilor. Memorii, introduction by Jean Ancel, translated by Ticu Goldstein (Bucharest: Hasefer, 1996), 43. 5. A. D. Xenopol, “La question israélite en Roumanie” (1902), and “Nationalism si anti-semitism” (1909), in Natiunea româna, anthology edited with an introductory study and notes by Constantin Schifirnet (Bucharest: Albatros, 1999), 273–312.